Modern, elegant and practical, Elite Storage Cabinets bring functionality without compromising on style. The rich espresso laminate flawlessly integrates with any space or decor. With one fixed and one adjustable shelf, the 32 In. Elite Wall Cabinet is a great choice for any kitchen, entryway, laundry room, or anywhere else you may need some extra storage space. This item can be wall mounted alone or paired with the Elite Storage Cabinet to extend your storage space to 89 inches high. Position multiple cabinets side by for a complete storage solution. Sophisticated and functional, the 32 In. Elite Storage Cabinet has 1 fixed and 2 adjustable shelves to store and organize all your personal items. This multipurpose cabinet is the perfect addition to any kitchen, entryway, laundry room or anywhere else you may need extra storage space. 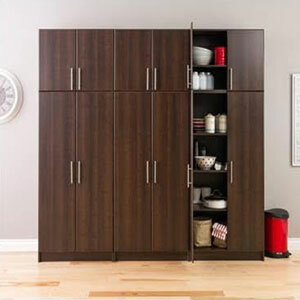 Use alone or pair with the 32” Espresso Stackable Wall Cabinet for a complete storage solution. All products are proudly manufactured in Canada using CARB-compliant, laminated composite wood. They ship ready-to-assemble, include an instruction booklet for easy assembly and have a 5-year manufacturers limited warranty.